Diane Von Furstenberg: "There's a Wonder Woman inside every one of us"
LONDON, England (CNN) -- On the surface, the similarities are striking; they were both princesses born in the 1940s in a foreign land. Young and beautiful, the long-haired brunettes soon fell in love and followed their men to the United States where they built a reputation for steely determination and strength. 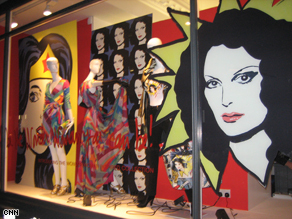 Diane von Furstenberg's comic book image appears in the window at the London launch of her Wonder Woman collection. Belgian-born New York designer Diane von Furstenberg has used Diana Prince, aka Wonder Woman, as inspiration for her latest collection, a brightly-colored clothing range that proves dressing like a cartoon character needn't involve teaming knee-high boots with hot pants. The influence of the American stars and stripes are evident in the collection, but in the star piece, a full-length dress, they blend together in muted tones, hinting only at their origin rather than screaming out superhero. The collection was launched in London last night, a day after Barack Obama stormed home as the next President of the United States. Diane von Furstenberg watched the election results from a London hotel room, having lodged an absentee vote from Asia. "I think it's amazing -- I think we need him desperately," she said. In what could only be a gift from the marketing gods, images of the President-elect dressed as Superman started appearing on street corners in the U.S. in the lead-up to the election. Obama has insisted he's no superman, but do the images demonstrate that America is hoping and searching for a superhero? If not Superman, maybe Wonder Woman? "It's not about a superhero," says Diane von Furstenberg. It's just because he's bright and he's willing to do the work. And he's young and he has energy, and that's it." She was created in 1941 during World War II by William Moulton Marston as a female alternative to the plethora of male action heroes who were saving the world in comic books of the day. He also invented the lie detector, the early version of Wonder Woman's "Lasso of Truth." As the story goes, Wonder Woman was an Amazonian princess who left her home on Paradise Island to fight the "Axis powers" in the world of man. By day, she was Diana Prince who, with a quick spin, transformed into Wonder Woman, ready to destroy Nazi enemies, foil Japanese plots and expose international spy rings. In the early 1970s, she became a cover girl for feminism, appearing on the cover of the inaugural "Ms." magazine. Fame followed on television when she was immortalized by actress Lynda Carter. After years of lying low, she starred in a popular exhibition "Superheroes: Fantasy and Fashion" at the Metropolitan Museum of Art in New York earlier this year. Curator Andrew Bolton says, "When designers look to Wonder Woman there are two things they seem to refer to -- her role as Amazon woman, this strong powerful Amazonian figure -- and her as a symbol of America, a symbol of democracy." In 2001, John Galliano for Christian Dior used Wonder Woman as inspiration for a rather risque ensemble which included a red and white striped jacket, starry gold bustier and tiny knickers. Bolton says the 9/11 attacks in 2001 sparked a resurgence in American patriotism that's been strengthened this week with the election of a man with a mandate for change. "I think that the idea of patriotism has become much more potent, certainly in light of recent events," Bolton says. "It's a celebration of a new regime, a new democratic regime." It's perfect timing perhaps for the launch of a fashion range that celebrates an all-American, albeit originally Amazonian, hero. For Diane, the Wonder Woman collection is more about empowering women than tapping into the zeitgeist: "The message is that there's a wonder woman inside every one of us," she says. She's penned a limited edition comic book to go with the collection, "The Adventures of Diva, Viva and Fifa," which is emblazoned with the message "Be the Wonder Woman you can be." All proceeds from the sale of the comic books, and a portion of the sales of the collection, go to Vital Voices, a non-governmental organization that aspires to empower women in developing countries, to address human trafficking and to train future leaders. "What Diane von Furstenberg has done for us, by the Wonder Woman book, by supporting us in the way she has done has raised the profile of Vital Voices," says Baroness Mary Goudie, one of the group's directors. "And by her example, she's empowering young women and other women around the world." A bit like Wonder Woman, really.